We left the house at the crack of dawn to meet the runners at Swayambhunath at 6.30am. It was amazing to see how many dedicated Hindus and Buddhists had come to the site to pay their dues to the Gods of both of their religions. 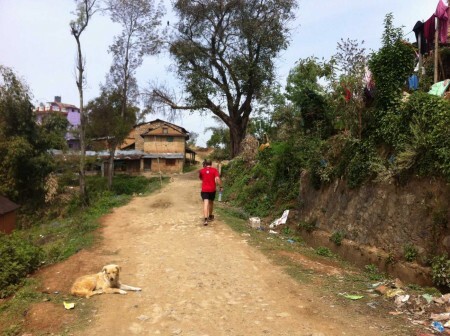 After we had located the 47 ultra trail masters and Richard had done his speech and handed out the bib numbers we were off and I was wondering what on earth I was doing trying to run 52km across the hills of Kathmandu. However, I came to the conclusion that if you don’t try you won’t find out whether you can do it or not. Trying to get through the worshipping crowds at the Stupa was the first challenge, however, it got better once we were down atÂ the ring road running across to Jamacho, which at 2,072m is the highest hill in the Nargajun forest near Kathmandu. For me (and most others) it was physically impossible to run up the steep single trail and so most of us reverted to walking. As Jamacho is yet another site for pilgrims to visit on a full moon, the trail was crowded with men and women scrambling up the hill. I was truly impressed to see how some of the women were Â climbing up the hill in their high heels and fancy frocks – it made using running shoes almost superfluous and I was wondering how quick they would be in trainers! 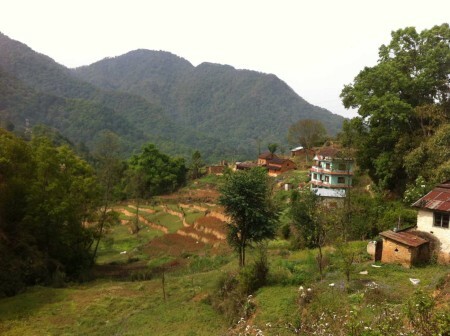 After having reached the top ofÂ Jamacho and fought our way through the crowds, the very well marked trail continued down a bumpyÂ road (with a few busses coming up to take the pilgrims to the site) to the first check point in Mudkhu, where we got some water and Â encouragement from Richard. “You have already done the hardest part of the race,” he said. “You will be cruising the remaining 32km.” Well, the thought of having to do another 32km was pretty daunting, however, I was feeling good and continuedÂ up the hill. The next stretch of the race led us through beautiful jungle terrain and even though the centre of Kathmandu was only a stone throw away it felt like being in the middle of nowhere – and extremely remote. I kept on following the yellow markings until I came to a point where it said in bigÂ yellow letters ‘5km’. I followed the arrow feeling excited about the next checkpoint, where I knew I would be getting some homemade flapjacks from my friend Clare of Himalayan Trails.Â However, after about 1.5km I realised that I had not seen any marker for a while and as there was not a single runner in sight, I decided to turn around in the fear of having missed a turn-off. Well, I was wrong – after having gently joggedÂ back for about aÂ kilometre, one of the runners came towards me pointing out that the ‘5km’-sign meant that we should just stay on that trail and not worry about markers. Fair enough. After having devoured a delicious flapjack, a banana and downed a litre of water the route continued upÂ the hill towards Nagi Gomba, a pretty little Buddhist monastery that is regularly frequented by western students of Buddhism. When I talked to the guys at the checkpoint there,Â I was very happy to hear that it was only another 8km to the finish as my legs were starting to get seriously tired – not surprising though given the fact that I had never run so far and long in my life. 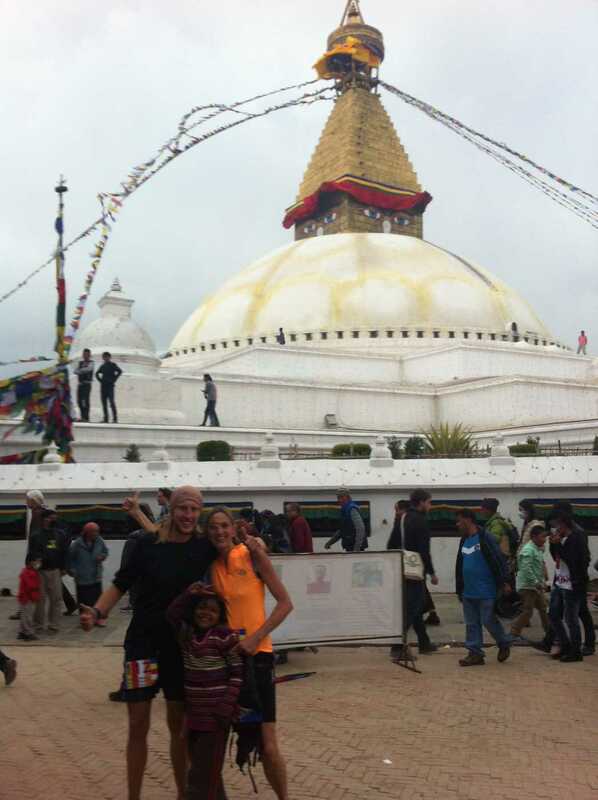 And so it was a relief to see that it was all downhill from there and when I finally laid my eyes on Boudhanath Stupa in the distance I knew that I would be able to finish this run. Apart from Joshua from the UK I had not seen any other runner for ages and I had no idea whether I was last – as I had feared – or whether I was in the middle of the pack. I kept on following the yellow dots and it was greatÂ to see that the route markers Lizzy, Mira and Richard even marked the routeÂ all the way to the Stupa, where I arrived after 9hrs and 38min. “Ultra Billi,” Richard shouted, “you came in 15th and you are the second fastestÂ woman.” This was very good and surprising news, had I been sure that I would come in last. Another lovely surprise was that my Iranian frien Parvaneh Kazemi, who is currently getting ready for her expedition to Makalu, had come to BoudhanathÂ to pick me up. 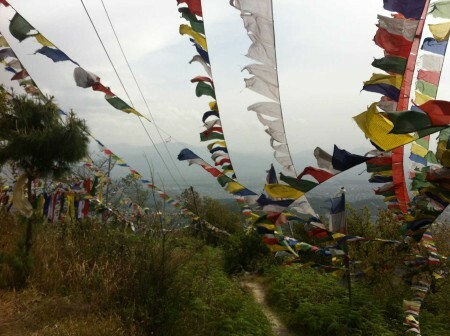 “I thought I should make sure you get home alright, especially now that the rain starts,” she said while ushering me into the taxi to get out of the strong gales that had turnedÂ KathmanduÂ into a sand-swept desert knocking over a few trees and sending signpost flying through the air. Once in the taxi the skies opened and a huge downpour descended on the city making me feel sorry for the people, who were still on the trail. However, everyone of the 28 finishersÂ arrived in Boudhanath safe and sound and fortunately nobody got hit by a falling tree, which I saw quite a few of on my way back to my house in Lazimpat. At this point I would like to thank Richard Bull, for never giving up to organise these events and for doing it in great style; Mira Rai, an amazing Nepali runner competing in and winning international events, and the ultra trail championÂ Lizzy Hawker for doing an amazing job at marking the route. They did it so well that even I found my way from start to finish with only one little blip. I would also like to congratulate the winners of the race, Alfie Pearce Higgins from the UK as well as Bhim Gurung and Bhim Bahadur Gurung from Nepal, who all finished the course in an impressive 6hrs and 44mins. The fastest woman was speedy Rojina Bandhari from Jumla, who only took 7hrs 22mins. And last but not least, I would like to thank my friend Parvaneh for picking me up and making sure that I get home just before the rain. Happy Easter to everyone – and watch the space for more races – I think I may have found a new sport :-). Se vuoi ottenere risultati positivi, devi allenarti molto. Sopratutto nei percorsi nepalesi molto impegnativi muscolarmente. Brava comunque. Liebe Billi, echt klasse!!! Beneide Dich………. I remember you bursting out of our toilet saying “Who is that at Boudanath?” in response to the photo of tiny me at huge Boudanath. 🙂 Lovely to see your photos and read your story.